The mean 3-day gross ratio can be used as a means of determining when an audience attends a film during the week: the greater value of the mean ratio, the greater the proportion of a film’s gross that was taken during the period Friday to Sunday. More details can be found in the PowerPoint presentation available here. This week I look at the mean 3-day gross ratios of films released in Sweden between July 2008 and July 2010 (See Table 1). Data was collected from Box Office Mojo, and all calculations were performed with values in US dollars but have not been corrected for fluctuations in exchange rates. The ratios are calculated from the first 8 weeks of a film’s release (or 7 weeks in some cases), with the opening weekend gross left out to remove the impact of previews. If we plot this information (Figure 1) we can see clear pattern emerging over time: the mean 3-day gross ratio of a film released in Sweden is lower in the spring and the summer than it is in the autumn and the winter. The median of the mean ratios for the 18 films released in weeks 1 to 17 (inclusive) is 0.5783 (95% CI: 0.5216, 0.6349); and for the 18 films released in weeks 30 to 52 (inclusive) is 0.5979 (95% CI: 0.5691, 0.6227). For the 14 films released between weeks 18 to 29 (inclusive) the median of the mean ratios is 0.4182 (95% CI: 0.3917, 0.4447). Although there are a handful of films released during the first and last parts of the year have mean ratios below 0.5, only one film (Prince of Persia: Sands of Time) released during the summer period has a mean 3-day gross ratio greater than 0.5, and even then it is only slightly greater than this figure. The trend line in Figure 1 is a second-order polynomial (y = 0.000298966x²-0.0152441x+0.65887), and R² = 0.3445. This indicates that week of release is a factor in determining when audiences in Sweden go to the cinema, but is not the whole story. What might explain the pattern in Figure 1? Well, the relationship to the seasons is a good indicator that leisure activities in Sweden are dependent upon the weather. 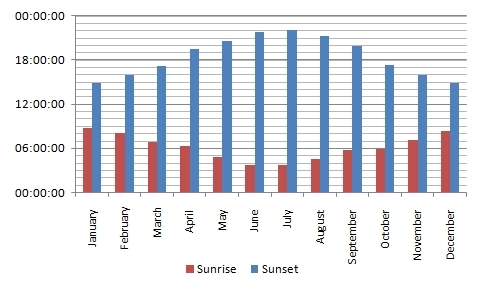 Figure 2 presents the typical sunrise and sunset times for Stockholm from the Visit Sweden website (obviously, if you go further north there are some parts of the country that have no sunset or sunrise at certain times of the year). Figure 2 Sunrise and sunset times for Stockholm. Looking at Figures 1 and 2 together we see that as the number of daylight hours increases, the mean 3-day gross ratio of a film goes decreases; and that as the nights become longer the mean ratio increases (although there is a slight displacement due to the effect of ongoing release). It is probably not the case that it is the number of daylight hours that directly influences the mean 3-day gross ratio. Rather, it is likely that people participate in a range of leisure activities that are not accessible at certain times of the year. For example, the Swedish football season runs from March to October and thereby provides competition for the disposable income of potential cinema-goers at this time of the year. However, the Swedish ice hockey season runs from September to March and so this effect may be small. Crucially, the difference between football, the cinema, and ice hockey is that the former is played in open air stadiums whereas the latter take place indoors. It would be interesting to compare the distribution of the mean 3-day gross ratios of films released in Norway, Finland, Denmark, and the Baltic states to see if similar patterns occur. It may be that the cinema-going habits in the most northerly parts of Europe are different to those in the most southerly.